Back when I was dieting I used to buy a friand as a treat occasionally thinking it was a low fat option – sadly I was very wrong! These delectable little treats are packed full of nuts, true – but they are also packed full of butter! Making them rich, moist and a very morish indulgent treat indeed. Traditionally a little French cake, they are extremely popular in Australia and found in most cafés. To make a true friand, you really need the distinctive oval shaped pans, but you can make them in small patty pans too. They are amazingly easy to make, doing nothing other than lightly whisking the egg whites. All the other ingredients are just stirred in and that’s it. Originally I made these as my daughter had made lots of things with egg yolks and I had more leftover egg whites than I knew what to do with. Friands are a great way to use egg whites, quick and less trouble than meringues. So do try making some soon and impress your friends with a friand! Preheat oven to 200°C/ 180° fan forced, grease friand tins. Soak cherries in brandy for 30 minutes. Toast the nuts (can do this in a microwave) and grind finely. Place egg whites in a medium bowl, or mixer bowl and whisk just until light and frothy. Sift in the icing sugar and flour, and stir in with melted butter and ground nuts. Spoon into tins, fill ⅔ full, top each friand with two drained cherries and several frozen berries. Bake 20 minutes, stand 5 minutes in tins before turning out to cool on cake rack. There you have it, one of the easiest little cakes to make, yet people are always impressed! I think the richness of the butter and nuts makes them seem special and therefore somehow difficult. But trust me they are ridiculously quick and easy and very delicious. Alas. 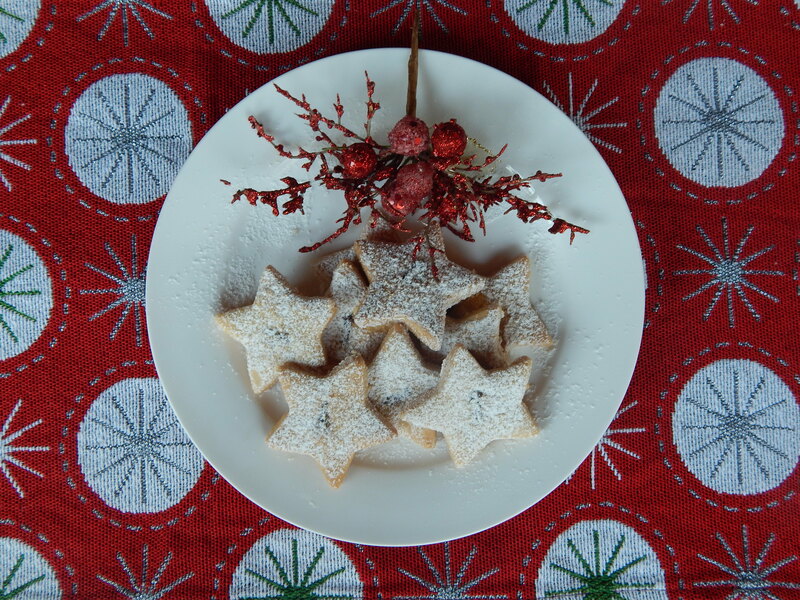 I have always made a lot of different shortbread at Christmas, especially when the kids were little and I would make heaps of Christmas goodies as gifts for their teachers at school, as well as giving them to our friends and workmates. I have a quick slice and bake recipe that has lots of variations, a Greek coffee & hazelnut variety, and my mother’s delicate and melt in mouth shortbread made with a lot of wonderful New Zealand butter and icing sugar. So I thought I had the best shortbread, until my dear friend Virginia offered me some of hers last Christmas and I was smitten! This rich, lightly spiced shortbread was the best I’d ever tasted – elevated to something really special by the addition of a clove embedded in each biscuit. I had to have that recipe, and a year later ………..I got it! Thank you so much Virginia for sharing this with me. And thank you for going to all the trouble to make some extra biscuits for me to photograph as I was rushing to pack for a holiday and ran out of time. Sugar and Spice Shortbread Makes 3 doz. Beat butter and caster sugar with electric mixer until light and fluffy. Stir in rest. Press mixture together to form a firm dough, Knead gently on floured surface until smooth. Divide dough in half; wrap in cling wrap & refrigerate 30 minutes. Roll dough between sheets of baking paper until 1 cm thick. 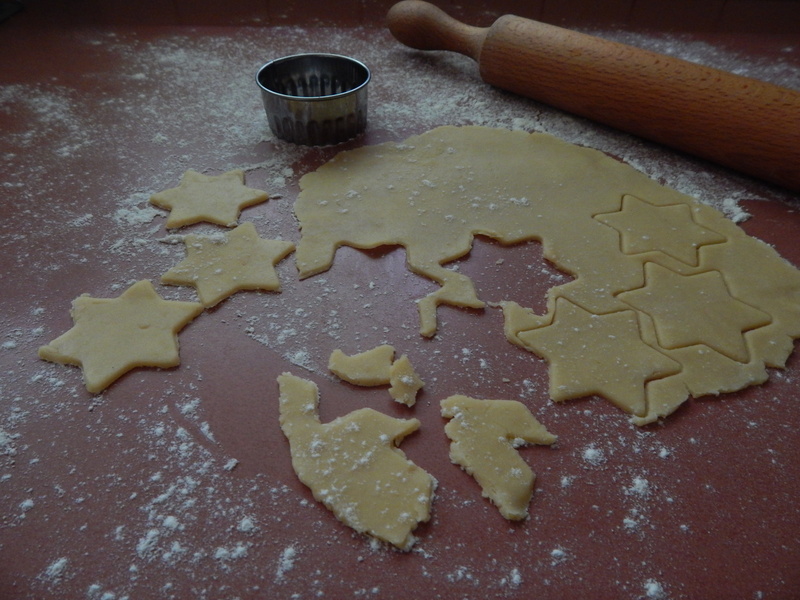 Cut dough into 6 cm fluted rounds or star shapes. Re-roll scraps. Place biscuits about 3 cm apart on lightly greased oven trays, push a clove in the centre of each and sprinkle with extra sugar. Repeat with remaining dough. Bake in slow oven about 30 minutes or until a pale straw colour. Stand 5 minutes before lifting onto wire racks to cool. My husband is Dutch and that opened up a whole world of new treats fro me to enjoy – this is one of the best Holland has to offer! Rich, buttery, spicy and filled with delicious h home-made marzipan, this fantastic Christmas treat is very special and looks impressive too, but is actually easy to make. Whenever I make it & give it to people they always rave about it – even my Dutch relatives! since it’s one of those things not many bother to make themselves anymore. Once you’ve tasted this though, you’ll never buy it again………it’s world’s away from the supermarket stuff. Basically it’s a very rich,risen spiced shortbread, filled with almond paste, topped with whole almonds and baked in a s;ice pan, then cut into small squares or fingers. With a food processor it’s a whizz to make, and if you’re in a hurry, you can substitute bought marzipan instead of making your own. The result still tastes great, the slice is a bit thinner, the texture is a little more dense, and the marzipan goes a little bit chewy round the edges, which we rather like. In Holland they sell Speculaas Kruiden or speculaas spice (rather like pumpkin spice, or mixed spice) in the supermarkets, but in Australia you’ll either have to go to a specialist deli, Dutch shop or make your own. In Sydney go to the fantastic The Dutch Shop t’Winkeltje for loads of great Dutch lollies, biscuits, Indonesian condiments, pickles, Dutch sauces and tinned goods and tons more. Plus they have a great little cafe inside chock full of old Dutch memorabilia, serving a range of Dutch treats like croquettes, fresh bread rolls with paling (eel) or gevookte zalm (smoked salmon) and Apple Tart, met slag room of course! Wash down with a glass of Chocomel, a can of cassis or a dutch-style filter-drip coffee served with cold milk in a cow shaped jug. Don’t be put off by how long this recipe looks – it’s a couple of stages, and resting time. All the work is done in a food processor, so it doesn’t take more than half an hour to actually make. I promise – you’ll love it! Process flour, butter, sugar, spices and baking powder together to mix well. Add egg and process till forms a ball of dough. Knead lightly on floured board. Pat into flat disc, wrap and chill 1 hour to develop flavours. Pre-heat oven to 180°C- 190°C. Cut dough in half and roll out to fill 17cm x 27cm brownie tin. Grease tin and line with half of dough. Roll out almond paste or marzipan to fit, lay on top of dough in pan. Roll out second half and cover. Use scraps to fill in any gaps. Mark into squares, place whole blanched almond in each square, and brush top with egg wash.
Bake 30 – 40 minutes until rich golden brown and almonds are toasted. Cool on rack in pan 10 minutes, cut into squares then allow to cool completely. Process all together to make paste, wrap and chill to mature 1 hour or best – overnight. Finely grind almonds with caster sugar, in processor. Add rest & form paste. Wrap and chill to mature 1 hour or best – overnight. You can leave out the cardamon & coriander if you wish but they do add a depth of flavour. It’s a funny thing but when you make speculaas, no matter what combination of spices you use or in what proportion, it always seems to taste the same! Happy Festive cooking to all and hope you try these tried and true recipes. Merry Christmas to all! And to all a Happy New Year! Ah Christmas! The scent of pine trees mixed with the perfume of Christmas lilies, the heady, spicy aromas of fruit pies or buttery shortbread baking. The faint rustle of wrapping paper, the gentle tinkle of glass baubles on the tree. The treats eagerly looked forward to all year, marzipan fruit, exotic cashew nuts, boxes of chocolates and all the rich array of special foods only had but once a year. The anticipation and the waiting made it all so much more special than it is now. It’s that time of the year again, when thoughts turn to all those traditional festive treats that I grew up with. Back home in New Zealand in the 60’s and 70’s that meant a hot roast lunch, no matter how hot a day it was. When I was very young, that would be Stuffed Roast Mutton with all the trimmings. Later on, when chicken became more affordable we had that – accompanied by baby new potatoes freshly dug out of the garden, minted new peas (also freshly picked) roast yams (bit like a sweet potato), roast onions, gravy, bread sauce or mint sauce with the lamb. After that there would be a Christmas pudding mum had made a month before, then steamed for 4 hours on Christmas Day, served with custard and lashings of whipped cream, and a sherry trifle as well. This was the only concession to the spirit (ha ha) of Christmas that my normally tee-totalling parents made. A massive meal which was a gargantuan effort for my mum who would be up at 6am to get the meal on. After lunch the herculean task of washing the mountain of dishes would be promptly undertaken – no resting here – followed by an afternoon tea of hot fruit mince pies, Christmas cake, and assorted shortbread. After that I think there was a lot of lolling around and not much else. It’s a funny thing but I absolutely adored Christmas pudding and really disliked Christmas cake while my sister loathed Christmas pudding but loved Christmas Cake. I would really only eat the marzipan and icing off the top of the cake. It’s funny because the ingredients are almost the same, but they taste so different. One thing we all loved and that was Mince pies. I have tried many different versions over time, and I’ve always wondered why bought ones, even expensive ones, tasted so strong – I finally figured it out when I started making my own fruit mince recipe. Traditionally the mince mixture is baked in the oven for several hours, this melts the suet and melds all the flavours together, before been baked again in pies. But my mum never did that , and I much prefer the fresher, juicier , unbaked version. So does everyone I have shared it with over the years, and I also developed a version for my vegetarian friends. 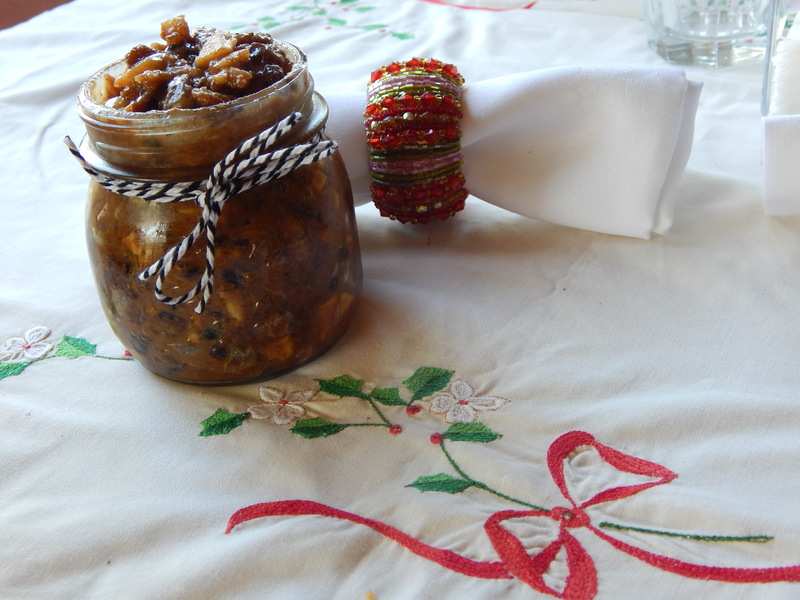 So here is my recipe for the best, freshest, tastiest fruit mince you’ll ever have. Please make this, and leave it for a couple of days or a week for the flavours to develop – but if you’re in a hurry you can use it straight away. In the warm climate of Sydney, Australia, it will stay good in the fridge for months, just give it a stir around every now and then. NB. (1) if using butter, add 1 tb flour (2) Suet mixture in Australia (Tandaco brand) is about 45% suet & 55% flour mix, so sieve it to retrieve the pure suet. Enough flour will still be in it to thicken mince slightly. Chop raisins, if large seeded ones, mix everything together in a large glass/stainless steel bowl. Cover with cling-wrap and leave overnight (in fridge in hot climates) to macerate. Will look very runny, but the fruit absorbs a lot of the liquids. Pack into sterile glass jars and seal. Can be kept in fridge for 3-6 months, in plastic containers, just keep stirring and add more rum/brandy if it’s drying out. 1 -2 egg yolks, 2 is better but 1 can do. Also depends on size of eggs. If eggs are really small, use 2. On floured board/bench, knead lightly until smooth.Pat into flat disc, wrap in cling wrap & chill 30 minutes before using. Fill with mince, don’t overfill as it bubbles up a bit while baking. Place top on, pinch stars to pastry to secure in place, or brush edges of round tops with water and press lightly to seal edges. My mum used to prick with the tops with a fork, or you can snip 3 x with scissors. Brush with beaten egg to glaze, sprinkle with raw/demerara sugar if you like. Bake for 25 – 30 minutes till light golden brown. After a few minutes, carefully turn out to cool on rack. Best served warm: Can be stored when cold in airtight tin for a few days and re-heated slightly before serving. 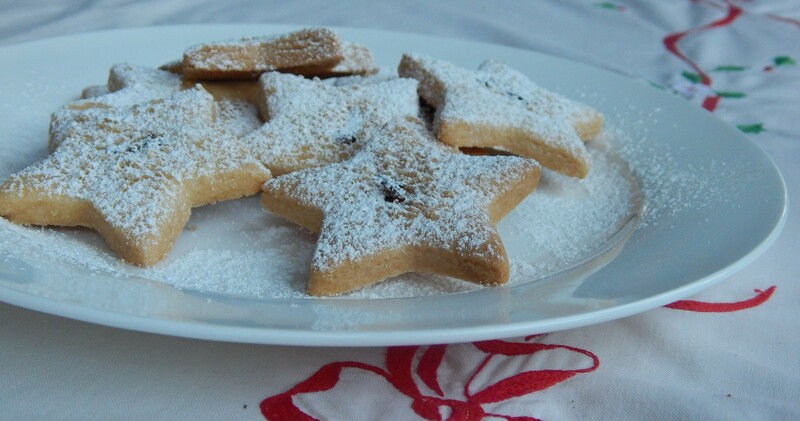 Dust with icing/confectioners sugar to serve. Serving Tip: Delicious served warm with a small round of rum / brandy butter on top. This an old English recipe called Cumberland Rum Butter and is a hard sauce traditionally served with the Christmas Pudding and with (warm) Mince Pies. It’s really decadent and will lift your pudding or mince pies to scrummy new heights! I adore it and urge you all to try it too! Brandy Butter seems more well-known for some reason than Rum Butter, but this recipe is much nicer and far more flavoursome. I have tried both, Brandy Butter is exactly the same except it’s made with icing sugar not brown sugar. I personally find it bland whilst this is fab. Beat butter till smooth, add sugar, nutmeg & rind and whizz /cream till well. Beat in rum slowly. Form into block or a roll with cling wrap and freeze. Or pile into serving bowl and chill well. Slice across rolls to form neat rounds to serve or cut block into small cubes. Served onto steaming hot pudding, it melts slowly and boozily into the pudding. On mince pies, place a small round on each warm pie just before serving. It adds a gorgeous rummy richness as it softens.